Home entertainment the hallmark of a geek: often at home, in love with being entertained and the latest and craziest gadgets and technology. 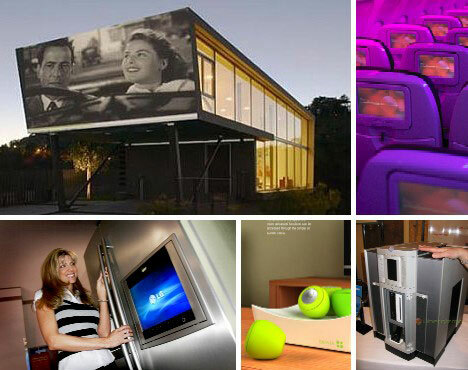 These dozen-plus-one geek home theaters and entertainment centers show just what can be done with a little cash and a lot of obsession. Space & science, the original geek passions, have blossomed onto both the silver and small screens in the form of Star Trek and Star Wars. It only makes sense to watch – again and again – one’s fave space operas on a suitably impressive set-up. 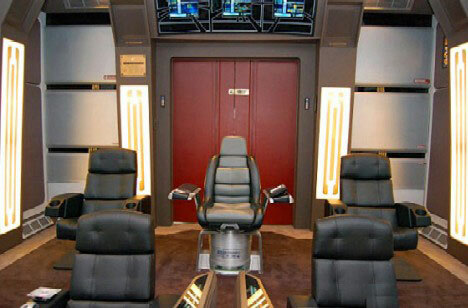 Gary Sekulow decided to “make it so”, and his incredible Star Trek home theater (complete with authentic Star Trek: Enterprise captain’s chair) is shown above. 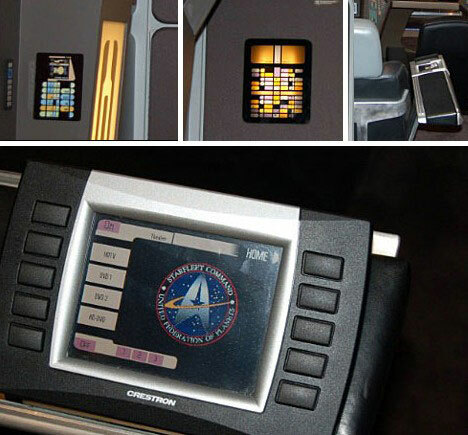 Besides the chair, which was used in seasons 1 through 3 of the TV series, Sekulow won some original set parts such as consoles and wall panels to up the cool quotient by several light years. The result may be a mix of various Star Trek series and generations, but no true trekkie is going to utter a word of Klingon in protest when Gary dims the lights. Going after the steampunk submarine look was a no-brainer for Moran, a life-long sci-fi fan. 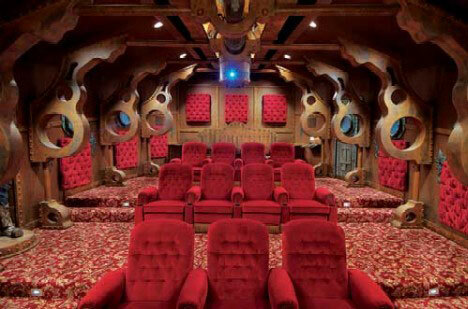 The 900 square foot theater was built by Paul and Sebrena Bohnsack of Audio by Design over an 18-month period. 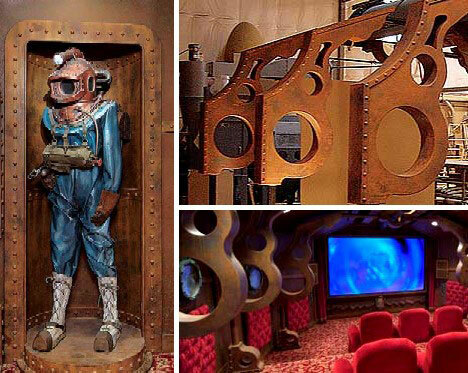 The result is the ideal spot to watch 1954’s “20,000 Leagues Under the Sea”… or anything else, for that matter. From the sea to the sky – which is where you’ll find Virgin Airlines jets that must have been inspired by more than a few geek home theaters. 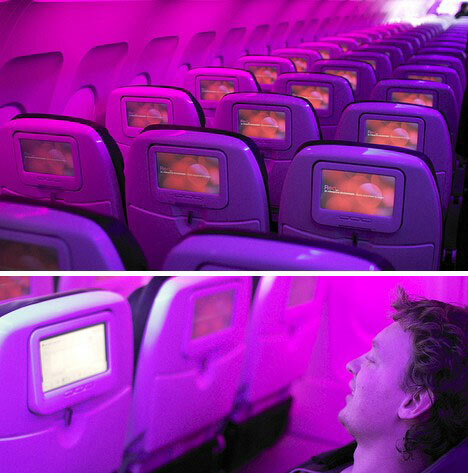 Artur Bergman reports that soft purple lighting soothes the eyes and allows the images on the in-flight entertainment device (IFE) built into each seatback to register with less distraction. Virgin America’s proprietary “Red” system also delivers live satellite TV, movies, mp3s, games – even chatting with your fellow passengers! Last and certainly not least, don’t worry if you created a custom playlist from the 3,000 mp3’s on file… the system saves your list and will pre-load it when you fly Virgin next time. Back down to earth, LG is making it easier for geeks to have their cake and eat it too… while watching their fave flick at the same time. Never again do sports geeks have to miss that big play while making a kitchen beer run – if they’ve got the LG LSC27990 refrigerator, that is. 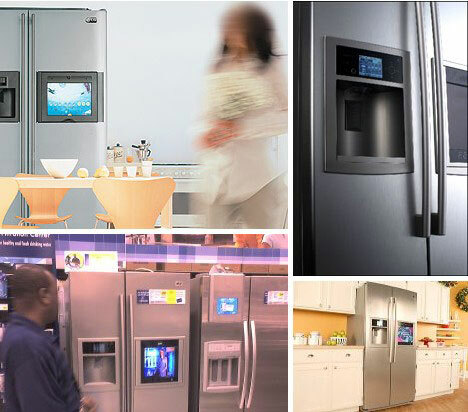 What could be better than having a 15-inch color TV in your fridge? Well, it could be an HDTV. And it is. Speaking of beer, Micro Matic thinks that even the few seconds it takes to get from the sofa to the fridge and back again are too long, especially when the two-minute warning hits. Their answer? 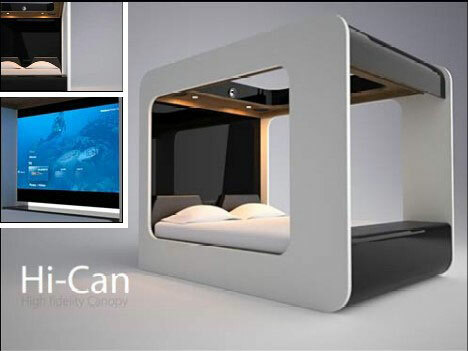 The v-Pod. 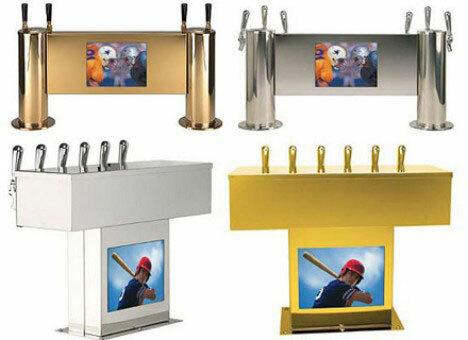 Available in a number of metallic finishes and a number of faucets, the v-Pod is an interesting concept but the screen size – a mere 10″ diagonal for starters – just isn’t sufficient. If it could dispense peanuts & pretzels, however, all would be forgiven. 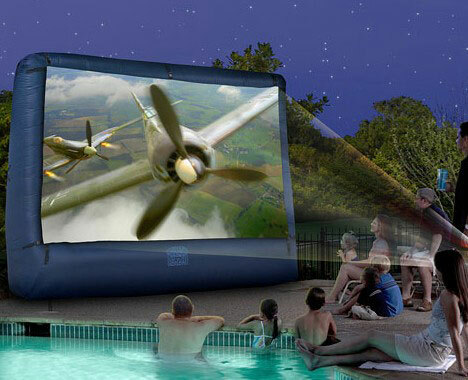 Being a couch potato only gets you so far, including the kitchen, so film & video buffs will want to consider this huge, 12-ft by 9.5-ft inflatable screen. Its 149-inch diagonal blows other portables out of the water, allowing friends & family to watch a feature film (perhaps not “Jaws”) from their poolside lounges – or from the pool itself. The screen is very affordable at just $198 from Wal-Mart but the buyer must provide the projector and speakers. If money is no object, escaping the confines of the home while still maintaining its comforts is a done deal. 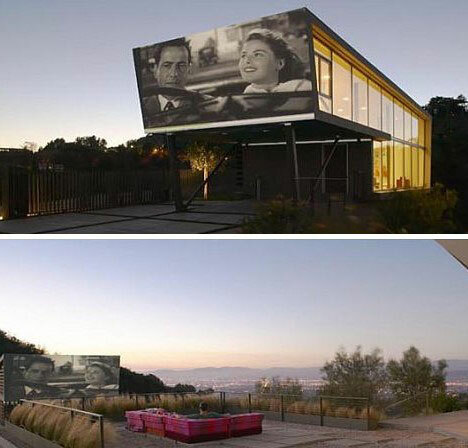 The above setup was designed by architect Hagy Belzberg for a luxurious residence in the Hollywood Hills. The enormous screen takes up the entire end of a glass-walled guest house, allowing comfortably seated guests to take in the stars… both on the screen and in the sky above. Those on a more limited budget can upgrade their geek quotient peripheral by peripheral, starting with this set of apple-shaped remote controls. The individual remotes are decked out in various shades of green so each family member can choose their own and personalize their preferred settings. Cool factoid: there’s no button-pushing, just turn & twist the device to adjust the functions. The modernistic “dish” not only stores your “apples”, it charges them up when they’re not being used. Apples not geeky enough? 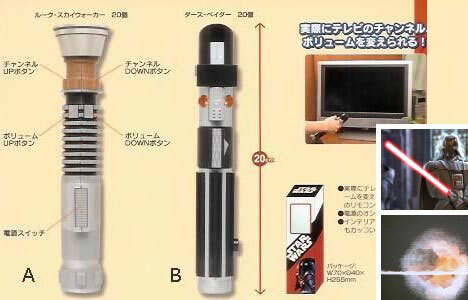 Force the issue with this Star Wars lightsaber remote from Japan. Available in two different styles, this geeky remote lets Darth Vader wannabes replay the destruction of Alderan over and over and over… at least until Mom calls them up for dinner. For those who want to keep the room generic and let the hardware do the talking, there’s the SE2 Labs ITC One integrated media system. 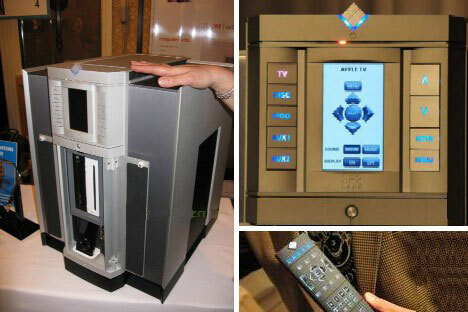 Stuffed into the sleek, modern cabinet are an XBox 360, Nintendo Wii, Apple TV, an iPod dock and a DVR. Sadly, no Blu-Ray player but in consolation, if the remote is misplaced it’ll beep when a button on the console is pressed. Whatever type of home theater system one has, HDD or not, the on-screen imagery is still flat, old-fashioned 2D. Not for much longer, it seems. 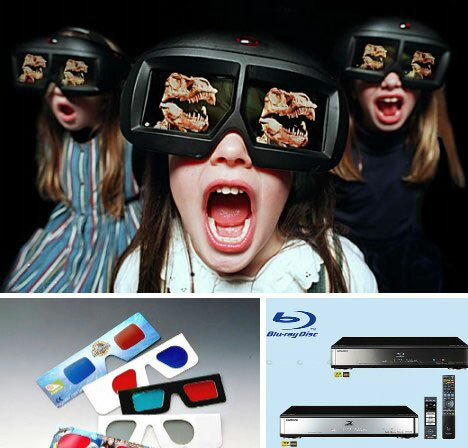 Mitsubishi has been working on a 3D Blu-ray player for some time now and it’s certain that once it hits store shelves, geeks and non-geeks alike should eat ’em up. We have seen the future, and it looks really cool with those red & blue glasses on!